If you’ve been following this site for very long, then you know that one of the biggest brick walls for this researcher has been determining the parents of my earliest Craven County Morris ancestor, Laban, who was born about 1781, married Caroline “Kitty” Williams in 1805 in Craven County and had several children (a daughter, Alpha, and six sons: John, William, Thomas, Joseph, Levi, Rowland). Strangely, although Laban does show up on an 1815 tax list for Craven County in David Chapman’s district, he doesn’t show up again on a census until 1830. After 1830, Laban and his family appear on the 1840 census and the 1850 census for Craven County (twice, actually, in 1850!) By 1860, Kitty has passed away and Laban is living over in Beaufort County. In late November 2013, I found an obscure reference in the North Carolina Genealogical Society Journal, which mentioned a Laban HENLY and sons, John and William, all of Craven County, North Carolina, changed their names to MORRIS in 1810. It referenced the General Assembly Session Records for that year, so as one might imagine, I wasted no time in planning a trip to Raleigh a couple of days later so that I could go to Archives and research that further. I had hoped to find his original petition for his name change, as that would’ve explained why he wanted his name changed in the first place, but unfortunately, the folder of petitions for 1810 did not survive. The only surviving record pertaining to the name change was the official written record, and the typed version in the General Assembly Private Laws for 1810. More recently, we discovered a record of Laban’s service in the War of 1812. Unfortunately, for now, we only have the index card (right) indicating that he did, in fact, serve, but we’re hoping more of those records will be made available at some point in the future. So, who were Laban’s parents? That’s the big question. And don’t worry, I’ll get to the reveal in a minute, but, first, I want to give credit where it’s due. We knew Y-DNA testing would give us some answers, so a few years ago, we began that process with my grandfather and Mike, and then branched out to add another Morris from another one of Laban’s sons about a year later. As the results started rolling in, the oral tradition was proven true. Our Morris men matched with Ledbetters right down the line. Now, we had to figure out which Ledbetter was Laban’s father. 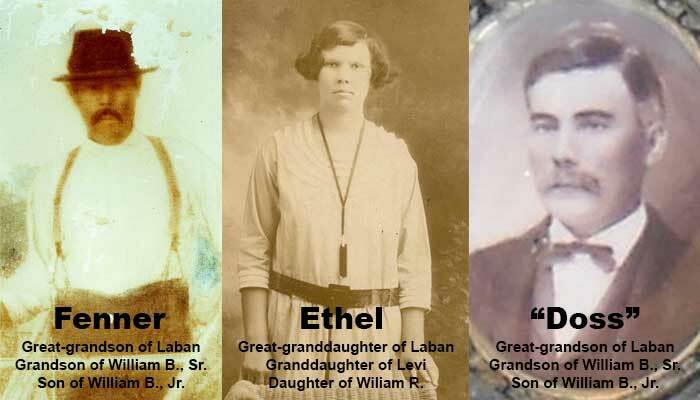 We had already done a good bit of research on the Ledbetters in North Carolina — at least enough to know which ones were of age to have been able to father Laban. We were also able to weed out some based on a too many mutations in markers of the Y-DNA. We had a hunch it might be one in particular — Rowland Ledbetter. He was the right age, and Laban had named a son Rowland, and had grandsons with Roland in their names, as well. And, the DNA of a descendant of Rowland Ledbetter lined up pretty nicely with our Laban Morris descendants. That still wouldn’t have ruled out Rowland’s brothers, or even his uncles or first cousins. There is a whole lot more to the story, and thousands of hours of research, but all of that, along with some new DNA testing we had done using FamilyTreeDNA’s FamilyFinder test, has revealed a very strong connection between my grandmother, Beatrice Cox Morris, (her mother, Ethel Morris, is a great-granddaughter of Laban Morris through his son, Levi), and Billy Ledbetter of Tennessee, a double-descendant of Rowland Ledbetter. It was remarkable that Billy showed up in her results at all considering there are no guarantees with distant cousins. As it turned out, though, not only did Billy show up in her results, they were predicted to be at the 3rd to 5th cousin level — and the FamilyFinder FAQ says a 3rd to 5th cousin match is most likely your 4th cousin — which would be just right, because if Rowland is Laban’s father, that would make Billy my grandmother’s 4th cousin once removed. My mom, Teresa Morris, also came back with a strong 3rd to 5th cousin link to Billy Ledbetter, but oddly enough, none of the rest of us did — not my grandfather (who’s actually one generation further from Laban than my grandmother is), not my cousin Mike, not our other Morris cousin, and not me. It’s important to remember, though, that even two siblings can show up with different cousin matches in the FamilyFinder test once you get farther out than five generations. My grandmother is exactly five generations from Laban, but six generations from Rowland. My mother was also predicted to be at the 3rd to 5th cousin level with Billy Ledbetter, even though she’s six generations from Laban and seven from Rowland, but that’s most likely because both of my mom’s parents are Laban’s descendants, so the combined segments show up in her even though Billy doesn’t show up as a match for my grandfather. Now, cousin Mike and I are working feverishly on trying to settle the matter of Laban’s mother. Thanks to FamilyFinder testing on several of us Laban descendants, we think we’ve zeroed in on the family of Laban’s mother, but we’re not confident enough to identify them just yet. We will say that we think she likely lived in the area of Wayne County, or old Dobbs County, when Rowland came through that area for a three-month tour during the War for American Independence. How does the Morris family fit into this story? Which Morris family fits into this story? Why did Laban wait until 1810 to change his name, considering he was already recognized as a Morris as early as 1805? Is it because he was called in as a witness to a lawsuit in Craven County that year? Who is Nancy Morris who’s living with Laban and family at least in 1850 and 1860, and probably as early as 1830? Who are Mary and Susan Morris, who are living with Laban and Nancy in 1860 in Beaufort County? Stay tuned to this continuing saga. We’ll post more as new discoveries are made, so if you aren’t already a subscriber of this website, sign up using the form at the top of the right-hand sidebar. Also, Mike and I are currently working on a book with all of our research, along with an updated record of Laban’s descendants, so stay tuned for details on that, as well. If you think you might connect to this Laban Morris family, please contact us either using the comments form below, or using the Contact page. A special thank you to my daughter, Sara Whitford and cousin, Mike Morris for staying on this trail. A special thank you to God, Almighty that only by his divine grace the answers we’ve been searching for (for decades) became available according to his timeline. Thanks to the Morris family members residing in eastern/coastal North Carolina for having stepped up and agreed to be part of this “hunt” and to those individuals bearing the Ledbetter name as living in others states not knowing we “might” be related by DNA testing but out of the goodness of one’s heart were willing to go the distance in doing what they could do to help us uncover the long standing generational mystery of our connection to Laban Morris of Craven County. Today we are grateful (beyond words) in our bearing a “fruitful” witness from the decades of wading through all kinds of papertrails, examining oral history, burning the midnite oil and the icing on the cake being the Morris-Ledbetter DNA testing project. HELLO Teresa, my name is Albert Lee Morris and I am very interested in this article I have been fortunate to find.My family members are from the Piney Kneck area of Vanceboro NC here in Craven County.My research has led me in direct relation to Laban Morris.I am interested to know of any other information.If you would please contact me.My email is morrismountain@hotmail.com . I am interest in who Caroline “Kitty” Williams parents are. I am a Williams researcher. Caroline “Kitty” Williams was the daughter of Tolbert Williams and, possibly, his wife, Nancy. I haven’t been able to find out who Tolbert’s parents are yet. His name is also sometimes spelled as Talbot. Here is his page on the family tree site. Here is a link to his estate papers. Sara, I did a dna test 2 yrs ago. How can I tell, how strong the morris line is in my family. I look so much like the morris family. My father looks just like aunt ethel. The photos that you sent me. Aunt ethel and my grand ma mattie are sisters.thanks cuz. Where did you do your DNA test? Was it FamilyTreeDNA? If so, what test did you take? Since your father’s father is not a Morris, the Y-DNA test won’t tell you anything about the MORRIS line, however, you can take a FamilyFinder test with FamilyTreeDNA if you haven’t already, and that should show how you connect with the other Morrises. You would most likely turn up as a cousin to the rest of us, and you’d be able to see exactly where the segments of matching DNA are on your chromosomes. If you haven’t already done the FamilyFinder test, you can order a FamilyFinder test kit here for $99. If you’ve already tested with FamilyTreeDNA, they should be able to run the test without you having to get a new DNA kit in the mail. You’ll definitely have to talk to Mike. He’s been my research buddy on all of this Morris/Ledbetter/Henby business. He lives right there in Stella and is a good guy. I’m Having a hard time tracing back pass Laban & Caroline if you could help me with more than what is here. Can you feel free to email me at jennifer756@gmail.com. Thanks. Hi Sara, I haven’t talked to you in years. When we last spoke, I was trying to figure out who Laban was. I’m glad you stuck with the research. My grandmother was Letha Morris Wilson. I look forward to hearing your updates on our elusive Grandpa Laban.